I always liked the saying “If you want to know if a man is well-dressed, look down.” But while this refers to footwear, and it can tell you a lot about how well-dressed a man is, I prefer to consider his socks. A man’s shoes tell you about how much money he spends, perhaps about his taste and certainly about how well he looks after his clothes. A man with well-turned, well-polished brown brogues under his blue suit demonstrates a certain interest and investment in what he wears. But socks tell you something different. Socks tell you immediately whether someone can be bothered. In the City, most suits are dark. Most men wear black shoes. So if they wear black socks every day, they will look smart, professional and have to spend absolutely no time in the morning thinking about their socks. 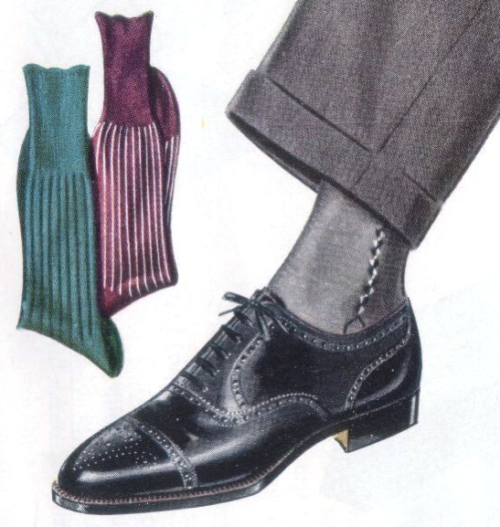 If, on the other hand, a City man decides to wear socks that match his suit, he will need at least three colours – grey, blue and black (yes, a depressing number of City workers still wear black suits). He will be more stylish and his legs will look longer. But he will need enough of each colour to make sure he doesn’t run out, and a certain time will be needed tin the morning to select the right pair. Travelling will take a little more thought as well. It’s not a big expense, but wearing socks that match your trousers shows you care. Someone boasted to me recently that he always wears a belt that matches his shoes. I asked him what colour his shoes were. He had three black pairs and one brown. And admitted he usually wore brown at the weekend. Not much of an effort to match his belt to them, then. Socks, on the other hand, take a little effort. Particularly if you get into the world of pattern, and have some stripes, spots etc. Then you have to consider the pattern on your trousers as well (roughly the same guidelines as ties – create contrast in the scale of the pattern). It all takes a little more time. Colours of course, are another big jump up. Dark red and dark green are often recommended for grey suits. I’ve always liked purples and pinks with navy. And bright red or yellow seem to fit best with tan shoes, in my opinion. But this is just one of the factors. As soon as you go for colour, the whole outfit has to be borne in mind. Is matching the sock to the tie a little too affected? Is it better if one is patterned? As with a handkerchief, you probably want something that harmonises without matching, but you are likely to have fewer options with socks than handkerchiefs. Unusual colours are a quantum leap from grey, blue and black. But look out for the man who can be bothered to match his socks to his trousers. It is the best and quickest sign of someone who cares. You can follow the discussion on Socks show whether you care by entering your email address in the box below. You will then receive an email every time a new comment is added. These will also contain a link to a page where you can stop the alerts, and remove all of your related data from the site. In the summer however, no socks. True, Jenna. I personally prefer half socks that remain invisible within the shoe but keep your ankles so much cooler. However, even this proves my theory. For the man that goes sockless with propriety, and stores all his chunky and wool socks until the autumn, is demonstrating more clearly than anything else in his summer wardrobe that he cares about what we wears. As I am sure, you would agree that this discussion is entirely dependent on a number of factors including both situational and location, and not excluding proper social graces. I would consider a play on sock color and patterning for situations that allowed such personal creativity. I agree that socks are important, yet let us not forget that there are very fine socks that are simply plain – quality always shows. Where then, one might ask, does wearing such colored or patterned socks apply in my book, well, I say maybe a dinner or museum opening. Nevertheless, it cannot be overlooked that there are situations where such a creative act could (and would) be questioned, if not proved fatal, for example, wearing bright colors or wild socks regardless of how well selected, and being the only one doing so, during a high powered critical business meeting or presentation. That reminds me of the recent commercials airing in the states of the person trying to pay for a client dinner with a credit card that has a cartoon on it – the lesson is that it did not go over well with the clients. One must remember that such subtle issues often influence outcomes. As to no socks, in the summer, same parameters apply in my view. I may go without socks in mid-July at the pool or shore but I am certainly not going to do it while in a dark suit in a Boston meeting. I would like to say that this is simply all good common sense. I agree entirely, Nicola. It is very much a question of occasion. I also do not necessarily favour bright or patterned socks over plain. It is a question of propriety and balance. However, I think socks are the best, certainly quickest, sign in London of whether someone cares about their appearance. I agree completely with the comments here. I especially like the title of your post, because I, too, believe that it shows careful thought. And that is always appreciated. One curiosity: should socks match the trousers or the shoes? I’ve heard both, but I’m curious to other opinions and reasons. I usually try to match the socks to my trousers. They are often solids like blues, browns, dark grays, medium grays, and rarely a black pair in a variety of weights for fall/winter, spring, and summer. I enjoy some play in subtle pattern however. In fact, I am always looking for the very subtle patterns that you have to be very close to notice. I’ve mistakenly matched socks to ties a few times without intention. It looked terribly affected once, but damn good the other time. Socks should definitely match trousers. That is the traditional rule, and it is practical, too, as it makes your legs appear longer whenever the sock is exposed. Subtle patterns work well, though the most important thing to bear inmind is relation to the pattern of the trouser, rather like a tie and shirt. As to matching ties and socks, I think it rarely works to match them. But they can certainly harmoise if the rest of the outfit is neutral enough to take it. If there is little interest above the waist then socks can be a nice way to add this. Rather than tie or handkerchief. Like a handkerchief, however, there will always be greater questions of propriety, as mentioned in previous comments. agree with comments by CG. I discovered Italian label Stanley Lewis who does this harmonising beautifully. I have been a fan since Christmas when I gifted my husband a pack. He now owns 5 different designs. http://www.stanleygentlemen.com. I prefer indeed matching socks to my shoes or dress shirt :). This might seem like a bit of a random question, but now that I have acquired over the calf socks in different colors, I’m wondering what to do with my old black mid calf ones. What do you do with your old socks? I keep two or three pairs that I might wear with trainers occasionally. But you have to throw them away really. Not much of a second-hand market for socks. Or give them to a charity if you can find something locally. What are your thoughts on linen socks for extremely hot summer weather in California? I like linen socks, and own several from Bresciani. I don’t find them that much cooler than a thin cotton, but then it’s rarely that hot in the UK. I was indeed looking at the 100% linen socks from Bresciana but have read that some spandex is preferable otherwise there will be piling in the toebox. I’m assuming thin cotton lisle would be the tried and true route? I bought the 80/20 merino wools socks from Bresciania in a 240 thread count but it seems they will wear too hot for summer. Yes they will pill, but not where it’s visible and it’s not uncomfortable. Yes fine cotton would be the standard. For no show socks, do you just buy them from Uniqlo?